Reports are out claiming that Manchester United boss Sir Alex Ferguson is maintaining interest in Chelsea midfielder Frank Lampard. The England international midfielder is off contract at the end of this season and yet to hear from Chelsea about new terms. The Independent claims that there has been cautious interest from Ferguson in the player, 35 in June when he is due to become a free agent. Lampard was also close to a deal with Los Angeles Galaxy, whose Major League Soccer season began last month, but that has fallen through. Key to any potential deal between LA Galaxy and Lampard was Tim Lieweke, formerly president and chief executive of AEG, the owners of the franchise. 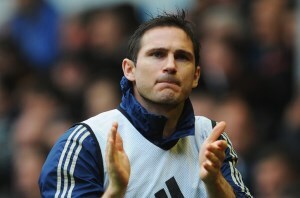 When he left the LA Galaxy in March the chances of Lampard moving there reduced significantly. The observations of the England manager, Roy Hodgson, that he would prefer Lampard to be based in Europe, have been another consideration.